We're glad you are coming to join in the fun! It's easy to learn. If you can walk and smile, you can do this kind of dance. The caller will explain all the moves and walk you through the dance before it starts, and continue to prompt you as the dance goes on. Pretty soon everybody in the room is doing it mostly right, and everyone is having fun! It's a great social mixer. This is "community" dancing. Come alone or with another; you're WELCOME either way. Our dances focus on the group, not on individual couples. There's no awkward singles scene, nor hidden agendas when asking someone to dance. People of all ages and social situations just come to have fun and dance! Both men and women are encouraged to ask each other to dance. We customarily change partners after each dance, so we get to dance with lots of different people. Even if you don't change partners, you and your partner will do a round of the dance with every other couple in your set. 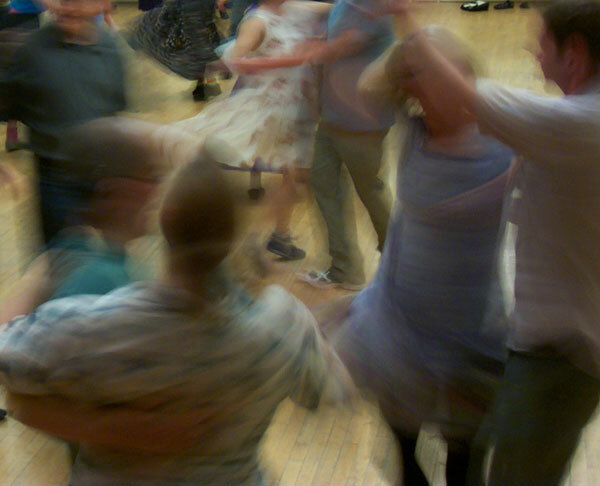 It's literally true, in some contra dances, that you will be swinging a new person in your arms every twenty seconds. Besides, we're a friendly group. We get to know one another, and go out for dinner before, or dessert after, the dances. It's easy, yet never boring. As quickly as you'll pick up the mechanics of moves, you'll also start seeing patterns, flow, rhythms, begin to appreciate the beauty of the patterns. There are thousands of dances in the répertoire, and new ones are being composed all the time, but always made up of the same basic moves, so you'll be amazed how fast you're an "expert." You walk up and down the length of the dance hall, interacting with the other dancers as you go, and the music carries you along. And there's the music Did I mention the music? It's all live music: fantastic fiddle tunes, driving Celtic rhythyms, Cajun and old-timey and whatever else the band gets charged up with. And that's just the contra-dance music. The music for English dance is another world entirely, and not to be missed. You can't get this kind of music in a concert, and you wouldn't want to. You need to be up and moving your feet to it. Want to try a taste? Of course you do! Many of our evening dances are preceded by a free newcomers' session to introduce the basics. If you are new to this kind of dancing, please try to arrive in time for that class (although it's not required). You'll feel much more comfortable much sooner. Plus, first-time attendees to the newcomers' session get a "next dance free" coupon! Oh and sure, while you're having fun, you can brag about the tradition. This is the dance form America grew up with, the barn dance, the hoedown, the fancy dress ball, and all the rest of it. It's been fun for more than three centuries - if that's not a trend, what is? Tell me more about this kind of community dance! What Kind of Dance Do We Do? Contra dances are done in long lines of couples. Two couples dance together as a group of four, going through a sequence of moves, or figures, for one round of the dance, until the two couples have changed places up and down the line and are facing the next couple, ready to start another round of the dance. You get a chance to walk through each figure under the caller's direction before the dance starts, and both the caller and your fellow dancers will help you remember what to do at each point in the dance. The dance repeats, so after a few times through your body will start to remember what to do, and you can fully enjoy the music. You can dance and have fun on your first night. No lessons are required, but if you come a half hour early we will show you the ropes. 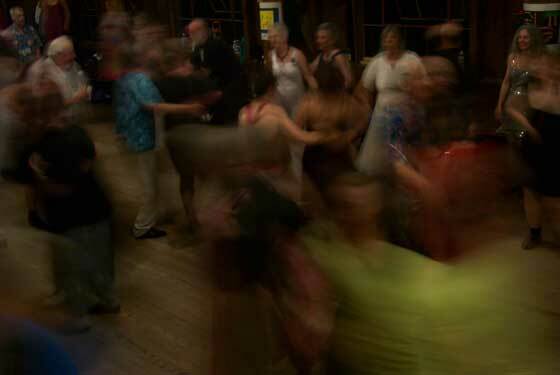 The mood of a Contra dance is upbeat and quick-tempo. But the music isn't as fast as it sounds. You can do every figure at a walking pace. 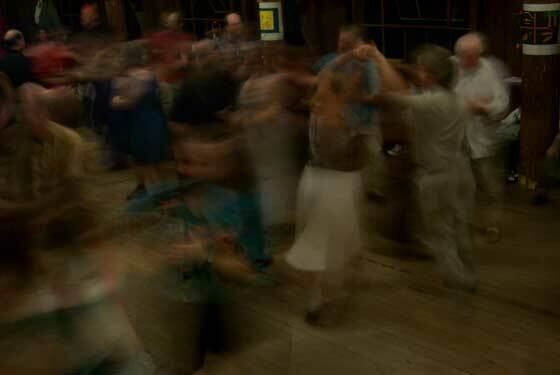 Here's a video example of a contra dance to give an idea of what it's about. We sometimes mix traditional square dances in with our Contra dances. Our kind of Square Dance is very similar to a Contra, with many of the same figures as in a Contra, but with 4 couples arranged facing inward in a square. No petticoats, no costumes, it's just another shape of fun. The caller walks you through the dance a couple of times (once for the heads, once for the sides, and once for the break figure, at least), and then you dance it several times through, with wonderful live music. It's a joyous concert where you don't have to keep silent in your seat! This is the dance form that American Squares and Contras came from. English dance has a long and varied history that goes back to the court dances of the Renaissance. In its modern form, it dates to 1651, when the publisher John Playford produced The English Dancing Master. English dancing remained popular right down to the 1820's, when it was edged out by that newfangled dance craze, the waltz. Today, the most familiar examples of English Country Dance come from movies of the Jane Austen era, such as Pride and Prejudice. English dance is richer in form and texture than Contra. There are more different dance formations (it's not all in long lines of couples). There are more figures, and more different styles of music. Most English dance is stately and elegant, with slower movements, and more eye contact. But some is just as vigorous and upbeat as Contra. Every dance has its own tune and its own tempo, and its own feel. Here's a video example of an English Country dance to give an idea of what it's about. "Ceilidh" (pronounced KAY-lee) comes from the Gaelic (Scots and Irish) word for a country dance party. This term (along with the American "Barn Dance") has been adopted by the younger set in England for a style of party dances that falls somewhere between Contra and traditional English. Ceilidh dances tend to be simple, fun, and high-spirited, the kind you can do in the pub with a few beers in you. The emphasis is on being lively and having fun. The future of our dances depends on our ability to pass them on to our children. Children (properly supervised) are welcome at all of our dances, and those as young as eight are capable of learning the figures and doing the dances with us. But it's easier for children to feel comfortable dancing in a setting that is structured for them and for their families, and that is why we like to offer family dances when we can. We have sponsored regular family dances in the past, and we run a regular Family Dance Camp each summer. We'd really like to resume running regular family dances. All it takes is someone to organize it, and a core of committed dancers to make sure it happens. Talk to us if you are interested. What Should I Expect at my First BACDS Dance? We're glad you're thinking about coming to one of our community dance events! This note is to tell you what to expect, and to give you some tips that will make your first experience more enjoyable. comfortable shoes to dance in: wear shoes that you can move in safely. You want something with a fairly slick sole and a low heel. Even Ginger Rogers was uncomfortable dancing in high heels. Be comfortable, wear those "sensible shoes" your mother always told you about. Don't worry about it your first time, but many regular dancers bring a separate pair of dance shoes with clean soles (no street dirt) to be kind to the wood dance floors and help them last longer. comfortable casual clothing: you want to wear clothes you can move in. The usual range is from casual to dressy casual. You may want a bandanna or handkerchief to mop your brow - this dance raises a sweat! Please don't wear strong perfume or cologne - some of our dancers are allergic. Think comfort and safety, and you won't go wrong. When at the dance: the first thing you'll see is the hall itself. It's probably a church social hall, a school hall, a community center, or a gym, and it won't be very fancy. These are the venues with good wood floors suitable for dancing. We try to keep our prices down to make our dances accessible to all, so we don't spend money on decorations. The lights will be full on. In this kind of dancing, you cover a lot of ground, and it's important for safety to be able to see where you're going. Change from your outside shoes to the comfortable clean shoes you brought to dance in; your feet (and the floor) will appreciate it! If you've come to one of the dances with a newcomer's session, you'll get a brief introduction to the basics of this kind of dance before the evening itself starts. It's a good idea to do this the first time, and maybe come back to the newcomer's session more than once. Dances are made up of figures, which have names like "ladies' chain" or "do-si-do". In the course of an evening, you may do ten different dances; the caller will tell you what figures make up this dance, and walk the sequence through to make sure everyone gets it. You won't be expected to have memorized the dances; you *will* be expected to listen to the caller, and to remember some figures. You and your partner for this dance interact with other couples up and down the set. If you don't know what you're doing, it will be very helpful if your partner does. If you come with a date, you should start dancing with other people immediately, and hook up again later in the evening, when you both have some idea of what's going on. If people try to split you up, it doesn't mean that they don't want you to go home together -- they're trying to help you have a successful dance experience. So, you wore comfortable shoes, you came to the pre-dance workshop, you found a partner for the first dance. The caller tells you what formation the dance is in (longways set, circle, square), and you and your partner take your place. The caller walks you through the figures of this dance, explaining exactly how the dance works and demonstrating any moves that are new or unfamiliar. The band strikes up a tune - driving Celtic jigs or old-timey reels at contra dances, a wide range of tunes at English country dances, almost anything at the barn/ceilidh dance - and you're off, moving to the live music, sharing energy with the band and the other dancers, seeing a new set of smiling faces with each round of the dance. The caller will keep prompting until everybody's got it; and the other dancers will help you if you get confused about where to go next. Body language is eloquent; if you're confused at any point, notice the nearby hand offered for an allemande or the eye contact from your neighbor inviting a swing. When the dance ends, partners thank each other, find new partners, and form up again, and the evening goes on like that — with a 10-15 minute break in the middle, announcements about other dance events, maybe an untaught couple dance (waltz, polka, hambo, schottische) here and there, and a last waltz at the end. You go home invigorated, flushed, and happy, with the sound of sweet music in your ears. Unless otherwise noted, layout and content Copyright © 2007, Bay Area Country Dance Society. All rights reserved. Contact us for more information about this site or BACDS.